The optical acrylic Vello LCD Screen Protector for Nikon D5300 is designed to protect your camera's screen from scratches, dings, sweat, oily fingerprints, and life's daily grind. Made of 1mm thick polycarbonate this protector guards your valuable camera's screen from dirt, scratches and oily fingerprints. Plus, it blocks UV rays while allowing 92% visible light transmission for clear and bright images. 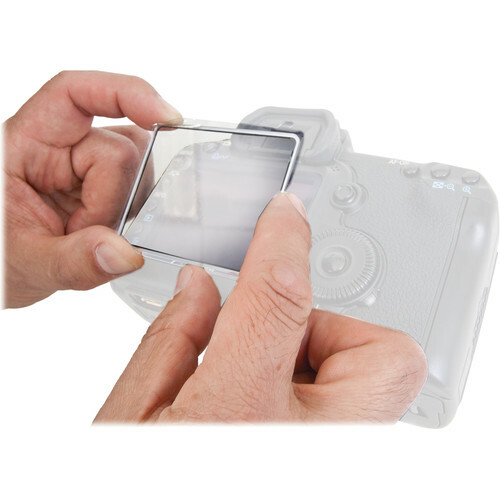 The protector is easily mounted to your camera's LCD screen with an adhesive backing. Once it is properly aligned, the screen should be smoothed down with a clean cloth. Note: May prevent LCD from fully locking. Note: Environments with excessive heat and/or humidity will shorten the useful life of the adhesive. The screen mounts quickly and easily to your camera's LCD screen via its adhesive backing. Once it is properly aligned it is smoothed down with a clean cloth and you are ready to go. Box Dimensions (LxWxH) 7.953 x 6.0 x 0.472"
LCD Screen Protector (Optical Acrylic) for Nikon D5300 is rated 3.0 out of 5 by 2. Rated 1 out of 5 by Sobral from Terrible When you install the protector in your camera screen, there is a little gap between the screen and the screen protector, so sometimes you accidentally press the protector against the screen and it gets sticked to the screen.